[2012 April] Legal Drug-Pushing: How Disease Mongers Keep Us All Doped Up the numbers used to diagnose diabetes and high cholesterol have been lowered over time. "The very numbers we use have been reduced to the point of absurdity," she said. "120/80 was considered normal blood pressure; now it's considered 'pre-hypertension.'" 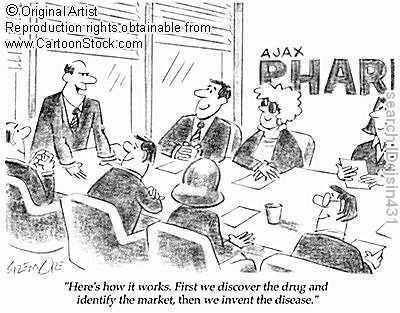 Entirely new diseases can be, and have been, invented to extend a manufacturer's patent on a highly profitable drug. Fugh-Berman said Eli Lilly stood to lose a lot of profits once the patent expired on its hugely popular antidepressant Prozac. "So they positioned this new condition, PMDD (Pre-Menstrual Dysphoric Disorder), and then went to physicians and the FDA with their highly paid experts who said PMDD is a tragic disease, and they got approved for Sarafem, the same drug. It's an on-label use for a repackaged drug; they created the disease and then got a drug re-approved that was going off patent." U.S. sales of ADD/ADHD drugs in 2008 were $4.8 billion. The U.S. uses 95 percent of all the methylphenidate and amphetamine drugs produced annually. And more than 90 percent of it is given to children. Without ADD/ADHD there is no market for these drugs because they have no health benefits. Methylphenidate and amphetamine are rated by the U.S. Drug Enforcement Agency (DEA) as Schedule 2 drugs, the most addictive and deadly drugs. Schedule 2 includes cocaine, opiates and barbiturates. Would you give a child cocaine daily? Try to imagine how children feel with these drugs in their young systems. HOW THE PHARMACEUTICAL INDUSTRY IS PREYING ON OUR CHILDREN by K.L. Carlson, M.B.A.
[2012 Jan] Baby Dies After 9 Vaccines in One Day By Christina England Stacy�s death was recorded as: Meningitis. Check out our Disease Mongering Engine where you can instantly generate your own fictitious diseases and disorders! "Medical research has made such progress, that there are practically no healthy people any more." � Aldous Huxley. [2009 Nov] A Nun speaks out on the H1N1 Pandemic: "The WHO changed the official definition of a pandemic" Interview with Sister Dr. Teresa Forcades . An articulate and authoritative statement by Gaspar Hern�ndez Last May, WHO changed the official definition of a pandemic -- it changed from a logical definition (a pandemic is an infection of global proportions and with a high mortality) to an illogical definition (a pandemic is an infection of global proportions). Under the new definition of "pandemic", the annual [seasonal] flu more than meets the requirements to be one. Are we going to declare a world health alert every fall? Besides absurdity from the scientific standpoint, this has serious financial and policy consequences. Pediatric bipolar disorder: An object of study in the creation of an illness, by David Healy and Joanna Le Noury, International Journal of Risk & Safety in Medicine, 19 (2007) 209�221. As outlined above, a number of forces appear to have swept aside traditional academic skepticism with the result that an increasing number of children and infants are being put on cocktails of potent drugs without any evidence of benefit. .........If the process outlined here was one that could reasonably be expected to lead to benefits it could regarded as therapeutic. But given that there is no evidence for benefit and abundant prima facie evidence that giving the drugs in question to vulnerable subjects in such quantities cannot but produce consequent difficulties for many of these minors, one has to wonder whether we are not witnessing instead a variation on Munchausen�s syndrome, where some significant other wants the individual to be ill and these significant others derive some gain from these proxy illnesses. To further increase profit, drug companies invent disease and subsequently, offer a solution. Herein lies the origin of deadly health myths. Such myths include, but are surely not limited to, that of high cholesterol being the culprit of heart disease, insulin being the only treatment for diabetics and that AIDS, rather than starvation, is killing Africans. Through "junk science" and "ghost writing," the general public and some of the world's most respected health experts have fallen victim to these myths.